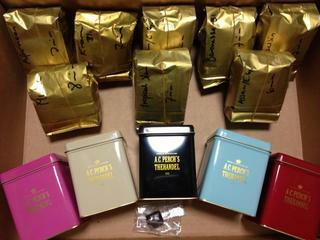 I imported tea from "A.C.Perch's Thehandel in Denmark this year. As I ordered tea with the shop bags and the stickers for gifts, the distributors politely added them to my order! I gave the white tea with the special cannister which is not being sold in Japan to my friend. in addition to my order, they presented a "white jasmin pearl tea "sample.